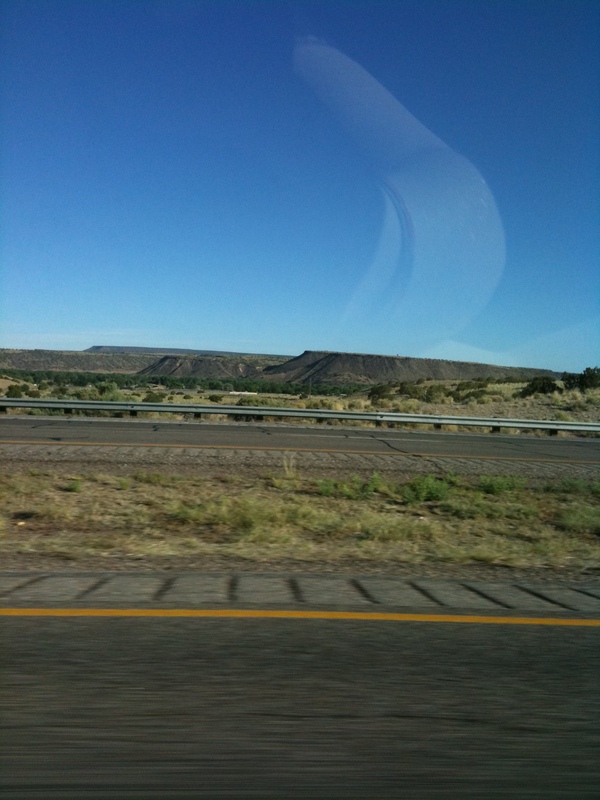 We got on the road at 7:30am this morning heading north on route 25 to Santa Fe. 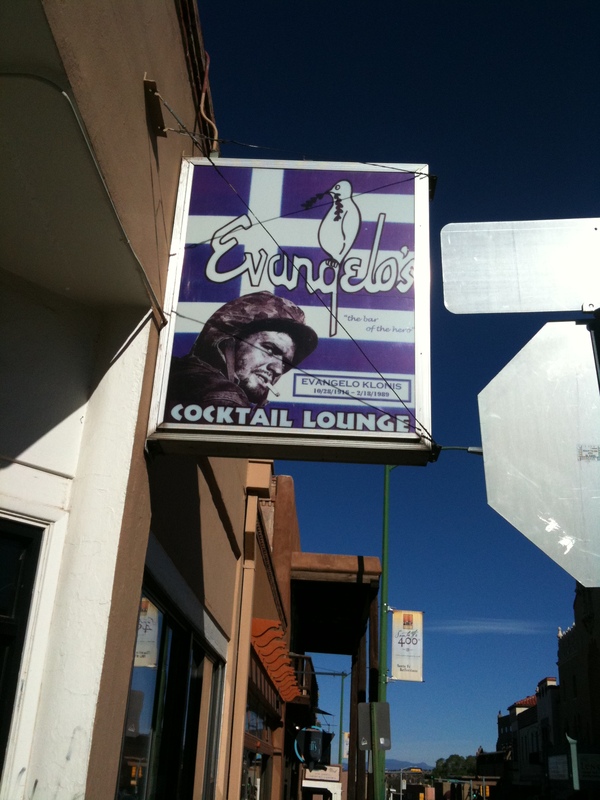 On the way back down to Albuquerque, we drove through Bernalillo. 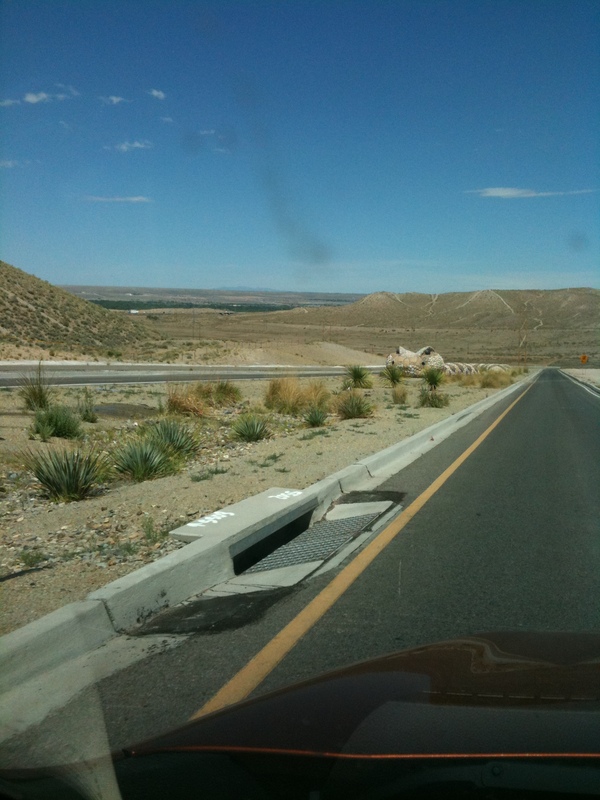 Unfortunately, they were doing a lot of construction on the old route 66. 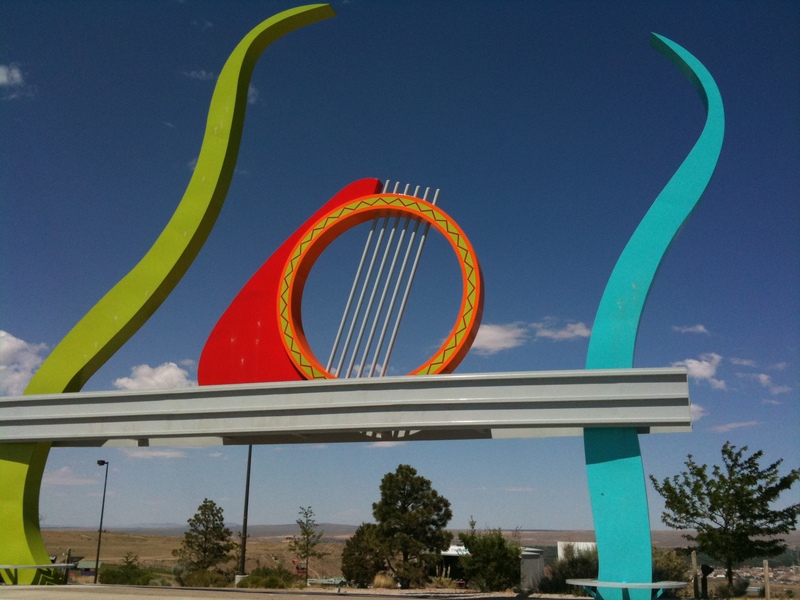 Hopefully they are restoring it, not modernizing it. 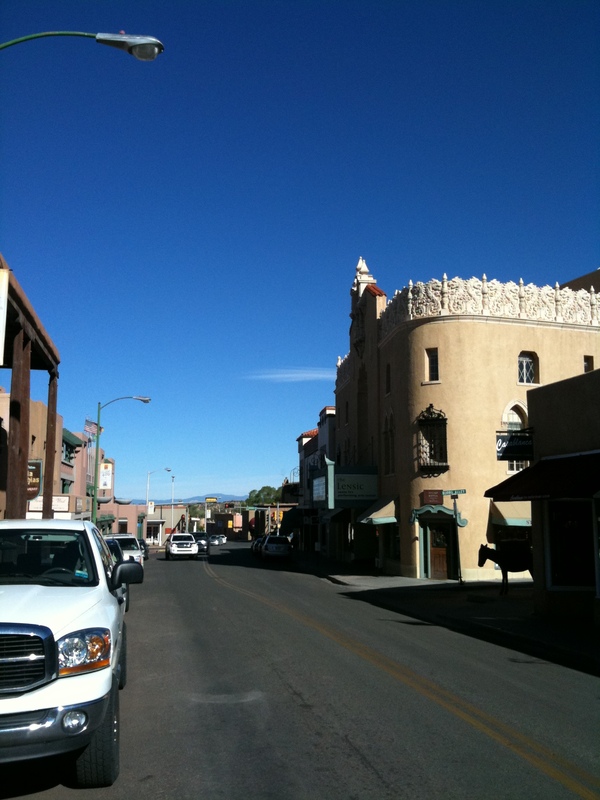 I like Albuquerque better than Santa Fe. I can’t explain it, but I’m just more comfortable. 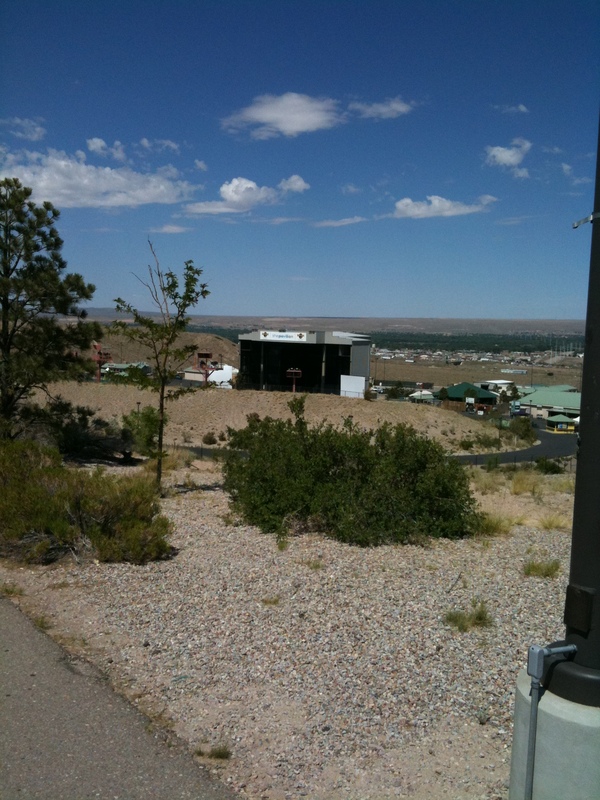 I went to see The Pavilion (another location for Crazy Heart), which was near the University of New Mexico. I had lunch at the Frontier Restaurant. Everyone told me to eat there. It was great. Luckily it was not a sit down restaurant because it was getting hot and Elvis and Cilla were getting ansy. I got a vegetarian burito, which was delicious and spicy. 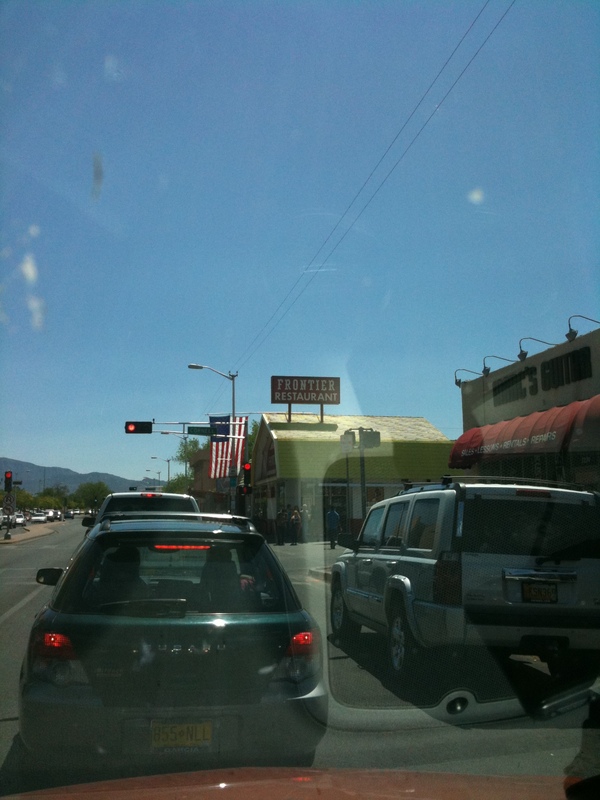 We went back to our hotel in Old Town and had lunch. Afterward, I wanted some of my fudge from the Big Texan. I had it sitting on the night stand when I went to the bathroom. I came back out to find half of the fudge and its container on the floor. Cilla had eaten the peanut butter fudge and Elvis was eating the peanut butter/chocolate fudge. Oh well, I guess they wanted dessert too. Luckily there was only a little bit left, so it shouldn’t be too bad for them. I’ve decided to shortened my roadtrip. Elvis is getting anxious. He doesn’t really like staying in hotels. He’s fine in the car, but stressed in the hotel room. Cilla is fine, she’s very go with the flow. 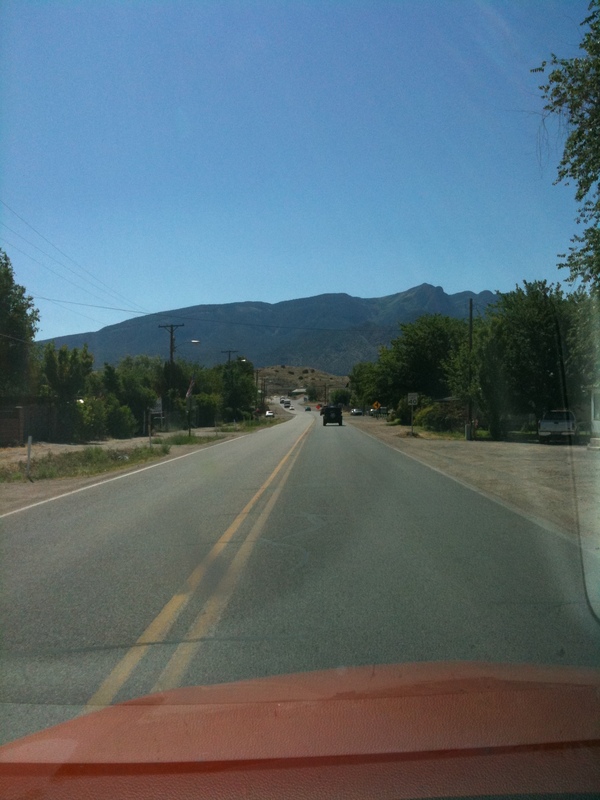 Besides, my main goal was to drive route 66 and visit New Mexico, and I did that. With the cancellation of the u2 tour, there are no other goals of my trip. So I’m going to save Montgomery and Savannah for another time and just tour Texas for the next 5 days. That way we can be home in Memphis for about 5 days before going to my parents’ in Maryland for over 2 weeks. This will give the dogs a chance to relax for a bit. So tomorrow it’s off to Lubbock then San Antonio then Southfork Ranch then Shreveport then home. Thank you. Yes I will be reporting everyday on what I’ve seen – along with photos. Thanks for reading my blog.